After the Tempo and Ronnie Dog Skin in FM17 and FM18, it’s not a skin with some specific name of some website like in the past. But the main idea of the skin is still the same – just make simple adjustments to make the game better. Some things are the same as in FM18, some other things were improved and edited, some things are better or they were removed completely. The skin was made in the default purple and also in the dark version. Instant result button included (before you will ask). This skin was made mainly for my own use, I’m happy with this version and I will update it only if something will not work. …the original files from DF11 were good but they needed some tweaks. I had to edit the code to make ‘player personal details panel’ (over the attributes) with bordered box. I also moved the bottom three widgets including seasonal stats up under the attributes same as I had it in the previous skin. All the boxes were made ‘bordered’, there is a pitch picture in the Positions panel and I included the PRO/CON panel so you can use it next to attributes where is drop-down. Same as all the rest of the widgets are available to change thanks to the included selector. Just click to the arrow and select your own widgets. In the end, I edited the player overview even more because I wasn’t satisfied how it looked. …and Cut-Out player picture with the signature and kit. There is also edited Player Attributes screen and Comparison screen, same as last year. The Background Support Mod created by Michael Murray was activated and I also added the coloured ‘ticks’ in the mailbox list and increased the size of inbox header so the pictures of staff are bigger. Another small thing was added as I increased the size of the player picture in the scouting recommendation card when you are in the Scouting Centre or in your mailbox. Same as in previous skins I added this panel to increase the size of pitch picture in the inbox when you receive the message with the info about Team of the week/month. Some leagues, for example in the Czech Republic, there are also substitutes for Team of the week. If you will leave this panel as I set it up there is a possibility the line with substitutes will not be able to see. You can adjust the width of the containers in the game which allows you to more easily customise. You can edit it like you want, just drag the line and move it up/down/left/right. You cannot assign a picture to an existing manager, if you want an existing manager to have a picture you would need to retire that manager and create a new one to take over but you won’t be able to keep any of your in-game progress. It isn’t possible to change the image after the profile has been created to make sure you are happy with the image before you get too far into your game. Whilst you can now edit your manager in a game this feature doesn’t allow you to change the profile picture nor will edit the face here override the set picture. If you want back the Caps Font just go to the „C:\Users\Documents\Sports Interactive\Football Manager 2019\skins\Rensie FM19 Dark skin\fonts“, open file called „title“ and insert this <string id=”capitalisation” value=”upper case” /> between the paragraphs. If you would like to use your own background picture instead of the default one just go to select your own picture and paste it to this folder “C:\Users\Documents\Sports Interactive\Football Manager 2019\skins\Rensie FM19 Dark Skin\graphics\backgrounds” and name your own picture default. Then just go back to game, clear cache in preferences and reload skin. You can also use all available background packs. 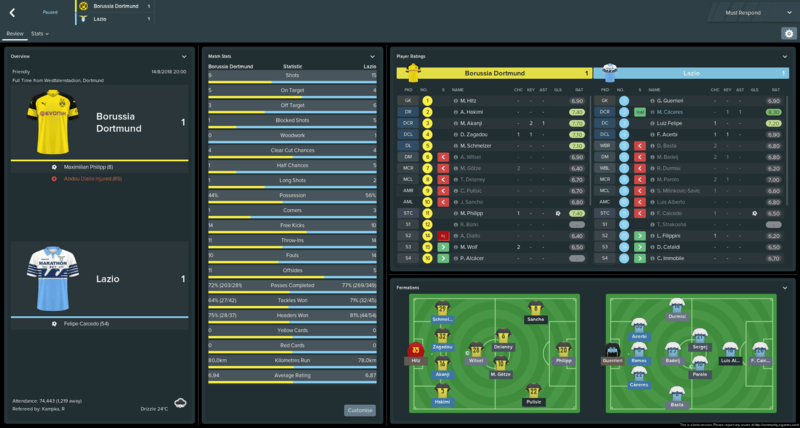 Coach & Scout summary in the player profile screen edited thanks to @FMPressure after a Public Beta version release. Michael Murray – Match In Between Highlights + Halftime/Match Review Screen Mods. Add Manager Picture and all other useful tips and advice. If you’re in the game just quit eliminating crashes or issue with the game. Run Football Manager 2019 and go to Preferences > Interface. Choose “Rensie FM19 Dark Skin” (or different version and hit the confirm button. This skin is mainly for 1920×1080 resolution but if you have a smaller resolution and you want to use this skin I recommend you to change it to “85% Zoom” in the Preferences. I used it like this many previous years when I had a laptop with a small resolution. There is also “50% Zoom” option in FM19. * Please note this skin is provided as is. It has nothing to do with Sports Interactive or SEGA and won’t be supported by them. You can join FMSlack via THIS link. ‹ PreviousA Legend in his Own Mind: The End, or Is It? Next ›Newcastle United – 1. I know the header is too high but it has to be there because the text would not be readable at some screens because of the transparency and secondary colours. Wow. Thank you so much again. That looks absolutely perfect. Well done! Hey Keysi, thanks very much for all this. I too want to use the dark skin with the larger attributes panel. The new link you share isn’t working anymore. Can you repost please? Hi John, just download the updated version through the download link in the post. All new versions are with the better titlebar. I’m using this pack https://www.fmscout.com/a-mini-stadiums-superpack-fm17.html. I just only usually change the picture for the club I play with. None of the stadiums show for me. Where do I place the folder with them in? Lovely skin mate! How can I remove my team logo visible in background though? Somehow managed not to see it – instructions are there, my fault. Sorry. Again – great skin! Me again. Are you planning on adding background selector? Also, I think grey colored thing around players, on Team Screen, would look better more transparent – graphics/tables/row thing. If you read the post about the skin I wrote there I make this skin mainly for myself and I want to keep it clear and simple. Background selector is something I really don’t need and I don’t want it in my skin. Most importantly I won’t add new things because someone will ask. Sorry for that but I would like to play the game at least one day a week and not continuously including new things. You can always download Resource Archiver in the Steam and create your own skin or add what you want. Thanks. Love it. Thank you for sharing it. Guess there is a bug at the team overview with the latest starting 11. Only the goalie will be shown and the other player popup more than 5 seconds later. Sorry to hear but I didn’t see this in my saves during the testing skin. I would recommend to clear cache and reload skin. Or try to don’t use other skins because we already found some skins clash with each other if you have them in the skins folder. Whenever I download, it just downloads as an actual folder instead of a ZIP folder, therefore I can’t extract any info from it? Any help? Why do the match panels never save for me on this skin? They always reset themselves, is this happening for anyone else? That’s a bug of the whole game, not just only of this skin. Hopefully it will be fixed soon. Just replied to you in the thread. It’s due to your laptop/screen resolution. I’d love to make the entire background the same colour as the page header, any tips on how to do this? any quick idea why i can’t select this from the preference menu? Be sure you have skins folders extracted straight in the “Documents/Sports Interactive/Football Manager 2019/skins”, not down in the another folder. I am having a problem, there is a bug in showing the scout summary. Dear Coloman4011, there is no bug. Try to read the post and you will find it was edited at the end of the November and that’s the reason why v1.3 was released. First of all thank you so much for your skin. The best so far. How do I make my skin looks exactly the same (with kits on the left and big). I tried to change things on the panels file but I’m really struggling with it. Thanks for your reply. I’m really struggling with panels to make exactly like that. Is there a way to make that specific configuration available for download? 1- Is there a way to make the menubar with the same color as the team? 2- Is there a way to show the city on the overview team panel? Hi Denis, go to skin folder and delete ‘match’ folder. Download this http://www.mediafire.com/file/0s08gednj1vfv0o/match.zip/file and extract it to to the skin/panels to have ‘match folder’ back and you should have the old match screen mods. If you want to change something else, for example. things you asked about, you have to download other skin or you have to find the answer on the SI Forum. As I said many times, I won’t make other versions of this skin just because someone asked about other features. All the tools, panels and graphics are available for free to download and everyone is able to make his own skin. I really love your skin Keysi, but I was wondering why when I go in my “club” tab and than I click on my “stadium” I can’t never see what teams play at my stadium. There is always no team! Thank you good Sir, you’re really nice! Struggling to get the match screen to look like yours, have cleared the cache etc but it still looks like i made it myself before downloading this. Plus i dont have the possibility to get vertical pitch on the “shots” and on your own formation. Any idea why? This looks quite good but I was hoping I’d find a skin that takes advantage of my ultrawide screen. Basically, FM is a game that would benefit immensely from the real estate a resolution of 3440*1400 provides, but I can’t find a skin that caters to that format. Can you help? Hi Keysi, I just want to say, GREAT WORK. This is what the default skin should have been from the start. 1. How do I change ALL fonts back to default? I’m kinda used to the default fonts and the thinner fonts in your skin made text hard to read on my TV with 4:2:2 chroma. 2. I noticed you have fixed the “Scouting in Progress” bug in v1.3. But I downloaded 1.3 and still got the bug. I’m using Windowed mode on a 1080p monitor, FM version 19.1.1 if that helps. Could you please share how to fix this bug? This skin is perfect for me except for the fonts and the “Scouting in Progress” thing. 1. You can delete ‘fonts’ folder in your skin folder and reload skin. 2. be sure you have deleted all the previous versions of the skin and you extracted the new version when you are not in the game. I’m 100% it’s because of this as it works normally. Thanks for your reply, Keysie. The thing is, v1.3 is the first Rensie skin I’ve downloaded, ever. I’ve deleted and redownloaded 4 times, twice from FM scout link, and twice from this site’s link (both are the same MF link). Is it possible that’s my problem is because I disabled auto updates on Steam? I’m still on v9.1.1. If this problem is only for me, could you please point me to which file I have to edit to remove the “Scouting in Progress” text? The texts are static, I’m thinking it’s possible to simply remove them from a file somewhere. Thanks again for this AWESOME, awesome skin. first of all: Great work! I really love your skin, the best i’ve used since the vitrex skin! One thing i would like to add is to show opposition roles/duties on Formation screen(s) maybe also the ingame boxes if this is possible? Do somebody know if this is possible and if it is how i do it? I can t put the caps front. Can you post a photo ? Firstly, thank you so much for creating this skin. Clearly the best skin of this year. I just have a problem, I don’t know if it’s a bug but I can’t find the drop-menu for teaching a new preferred move in the Rensie FM19 Dark Skin version, if I change to other versions the drop-down menu does appear. I tried to mess with the panel’s files but I couldn’t make it. Hi, do you mean this drop-menu on Development screen? see in the screen http://prntscr.com/mu133m. If it’s something different, just post a screenshot here. Hi. I’ve had a problem with the skin since patch 19.3. During games, the bottom right panel changes away from AM Feedback to League Table, or Latest Scorers if cup game, and even if I change it back it just changes after next highlight. I’m playing on an ultrawide monitor with 3440×1440 resolution so that could be the reason, but if that’s the case are there a way to fix it for me? Unfortunately, that’s a game issue, not only skinning problem. It’s a same as some panels/widgets still resetting on various screens. Hi im loving using your skins , would like to know if there is a way to use panels to show opposition roles/duties on Formation screen? 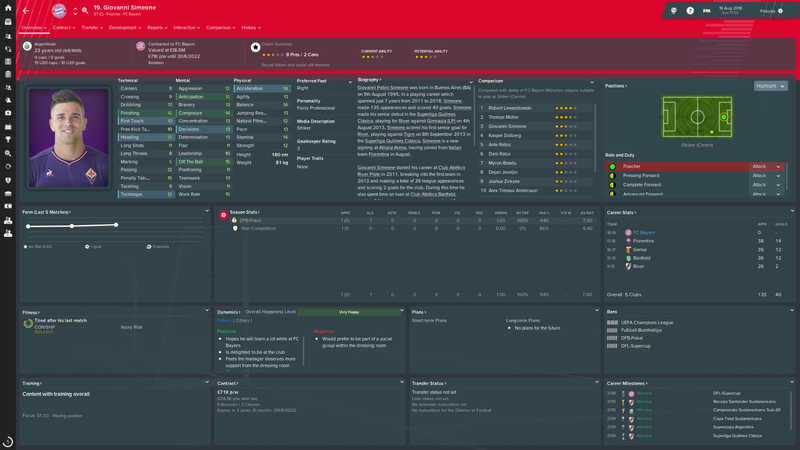 I absolutely loved The Higher Press skin for FM17 and your 2019 skin is also superb. What I am trying to do in 19 is to get the boxes completely transparent so I can see the stadium in the background for each club, like in 17. For me this hugely adds to the immersiveness of the game, the solid boxes make it a bit ‘cold’. I’ve read about changing paper files etc but I’m in no way a coder. Do you happen to know an easy way to do this? A lot of people want a transparent skin, apparently. Just go to the skin folder/graphics/boxes/custom/background. Rename folder “0” or “10” to paper. And make the same with “paper@2x”. And reload skin. The boxes should be more more transparent. Hi Keysi – I downloaded the file and extracted into the skins folder, as you instructed. However, I can’t locate the skin in the Preference/Appearance/Skins in FM19. I’ve already cleared cache and clicked reload skin, but your skin doesn’t show up. Would you please advice? Thanks. I fixed the problem. I had to save all 4 main folder out of the major folder. I can see them now. Thanks. Brilliant. Thanks so much. If I could also ask, is there any way to make the match screen title bar any smaller? It really gets in the way of the match. Shame there’s no auto-hide, like in fm17. Hey Keysi, great skin as always. Hi, it’s, unfortunately, a common issue of the game, not just the skin. It’s happening also if I set different inbetween highlights. I now use something similar as it’s in default skin but with customised formation panels and it happens as well. It’s the same as widgets are resetting at Player and Team stats screens when you use ScreenFlow for example. Game can’t deal with it. Don’t know why.